We are located in New Port Richey, Florida. The perfect climate for year-round fun in the sun cruising! If you have any sidecar memorabilia or use sidecar parts you would like to sell please contact us! 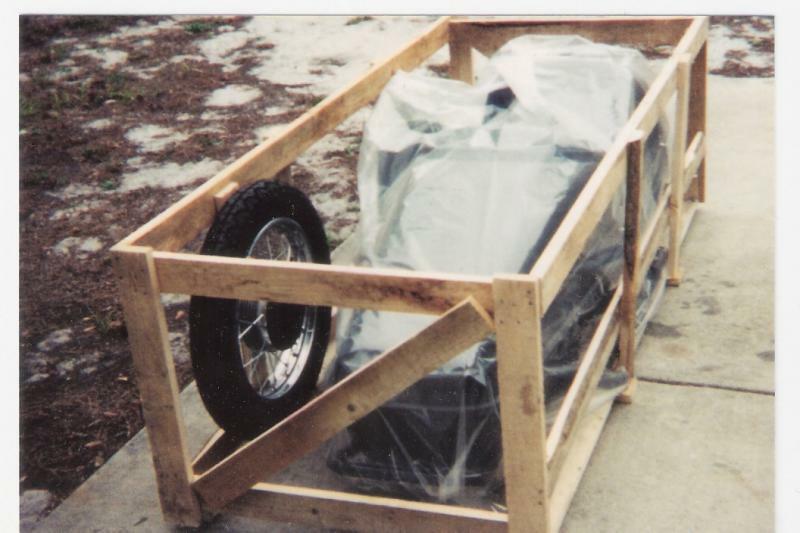 This is my first sidecar, a brand new 2000 Velorex on my 1974 Harley Shovelhead. 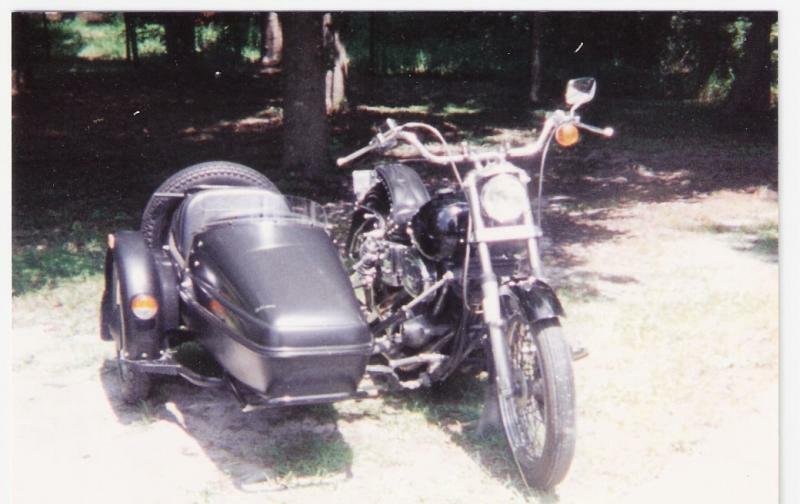 I had this bike for 23 years and added the sidecar in later years. A Velorex is a great sidecar and you really get alot for your money! Check back often as we will be adding more pictures and products. Two covers I made. I made a sidecar tonneau cover for my Champion Legend sidecar to be used without the wind shield being on the sidecar. 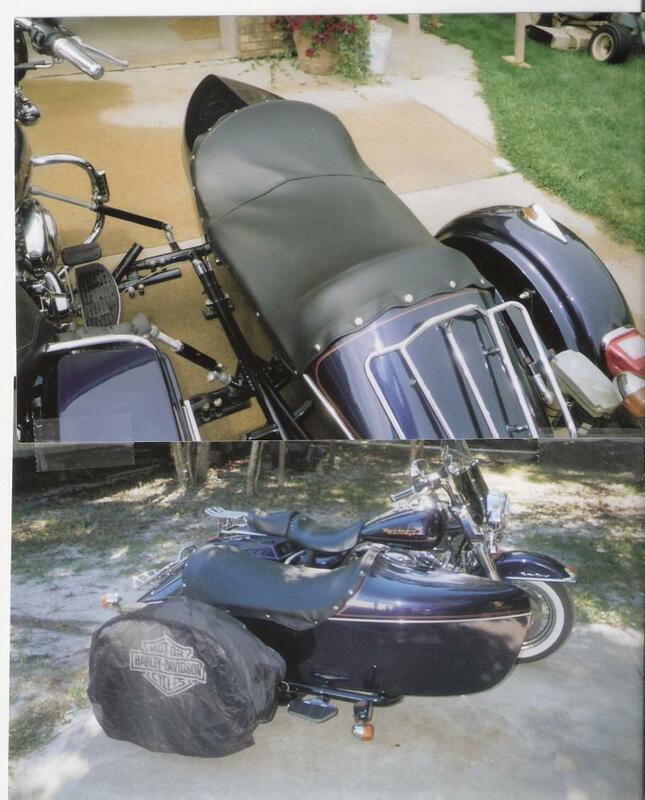 I tryed to buy one from the Champion sidecar factory in California but they just make one type of tonneau cover for the Legend sidecar that goes over the wind shield and I have one of them. The sidecar fender cover I made out of some old worn out motorcycle covers I had. It works good. The above picture was taken of me (SidecarMark) in front of a fountian in Dunedin Florida Thanksgiving day 2016 at a friends condo. The weather was about 80 degrees! 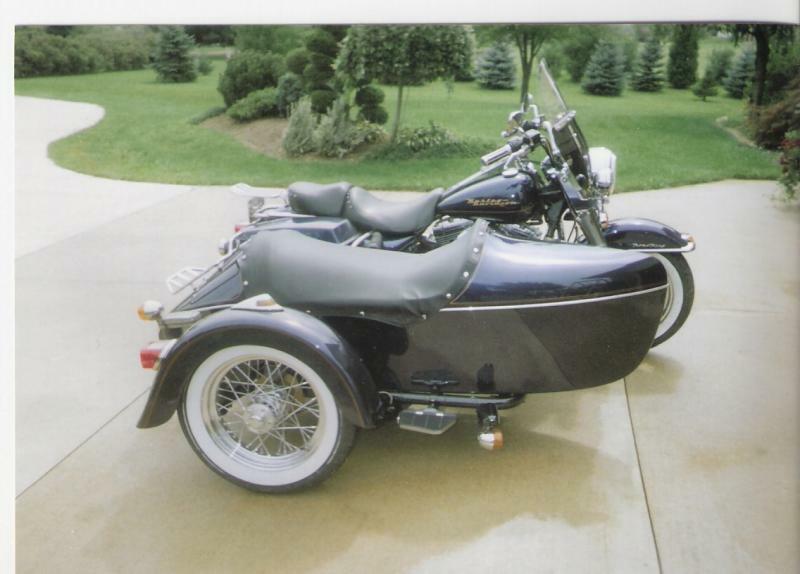 As you can see from the picture below I had just replaced the chrome trim on the sidecar. After 11 years it was very ruff. I added some more chrome strips as I like that style. 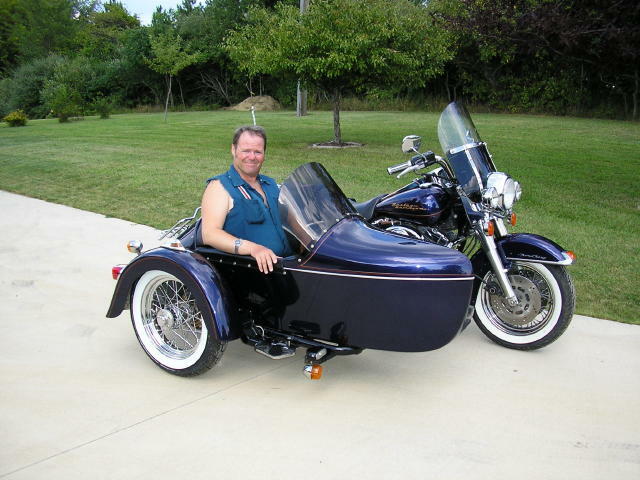 Me in my 2005 Champion sidecar on my 1999 Harley Davidson RoadKing. Picture taken when I was on vaction in Michigan in 2006 at my parents house. 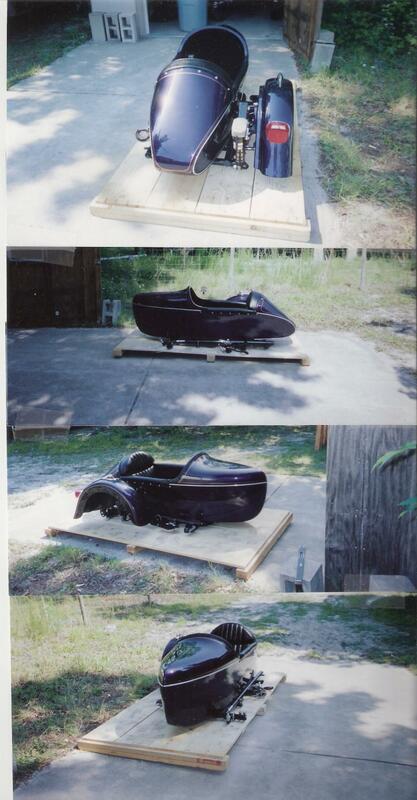 In the pictures above I had just recieved my new 2005 Champion Legend sidecar which was manufactured in California. 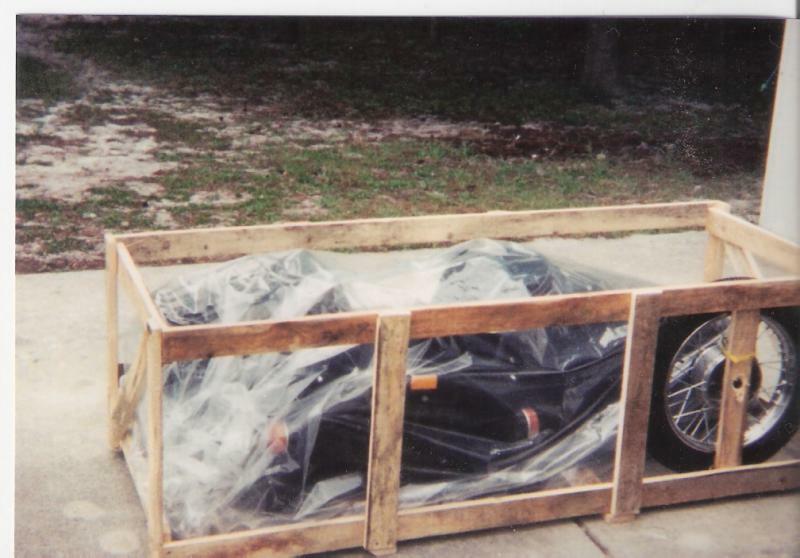 In these pictures it is still bolted to the bottom of the shipping crate. The metal cylinder in the back is an electric lean control which works great! When a passenger gets in the sidecar their weight will automatically compress the suspension, tilting it to the right. To auto-correct this just hit the switch and level it out. The sidecar body is a copy of the old Indian sidecar. 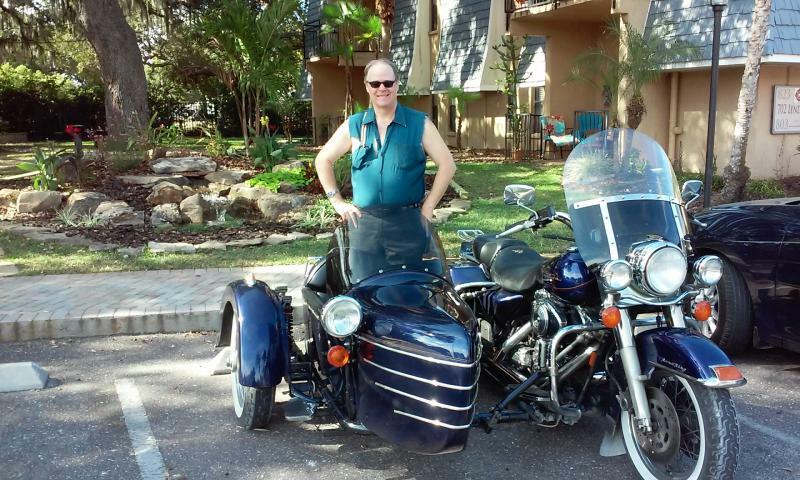 I have ridden this sidecar outfit across the United States two times and it handled perfectly. P.S. Check out my travel pictures. I have installed both my sidecars and while it is a job and a half, after making all the necessary adjustments they handled fantastic.